Mary Marshall is very knowledgeable on the subject matter and made class very interesting. Thank you! K.A. Mary covered a lot of topic matter and did so with ease. I am now reading books on topics I had never related to ghosts and hauntings before taking her class. She was knowledgeable, informative, and presented the topic matter well. I will be taking more classes of hers. John P.
Instructor was knowledgeable, personable, and the subject matter was interesting. Mary was a pleasure to learn from. Develop a broad knowledge of how spirits are understood globally and the social roles they play that will give you a new perspective on what Western societies consider ghosts, spirits and the paranormal. Come to understand the importance of culture in this field. Learn about the different type of haunting and phenomenon. Different types of entities, their behavior, capabilities, and interactions with us, and how to best handle it will be explained. Psychological, physical, and spiritual aspects will be examined. Real Paranormal Investigation cases will be discussed. We will be examining the challenges and techniques used in paranormal investigations that take place outside. The weather, animals, and more all effect how investigation must be done. We will explore the use of specific equipment, controls, and adjustments that are used. We will review evidence captured and the best practices for getting evidence. The focus will be us exploring the an on going case in the Kettle Moraine in Wisconsin. This fascinating case encompasses ghosts, shadow people, Bigfoot type sightings, light anomalies, UFOs and more. Is there such a thing as a paranormal vortex? Come join us and find out the answer. Where are these classes available? Classes are offered at Various Colleges and Schools. Check with the schools to find out when the classes will be offered at that particular location. Not all classes run at all locations at the same time. Usually different schools will be focused upon during diffeent seasons or even years to stagger the availability to any one particular area. 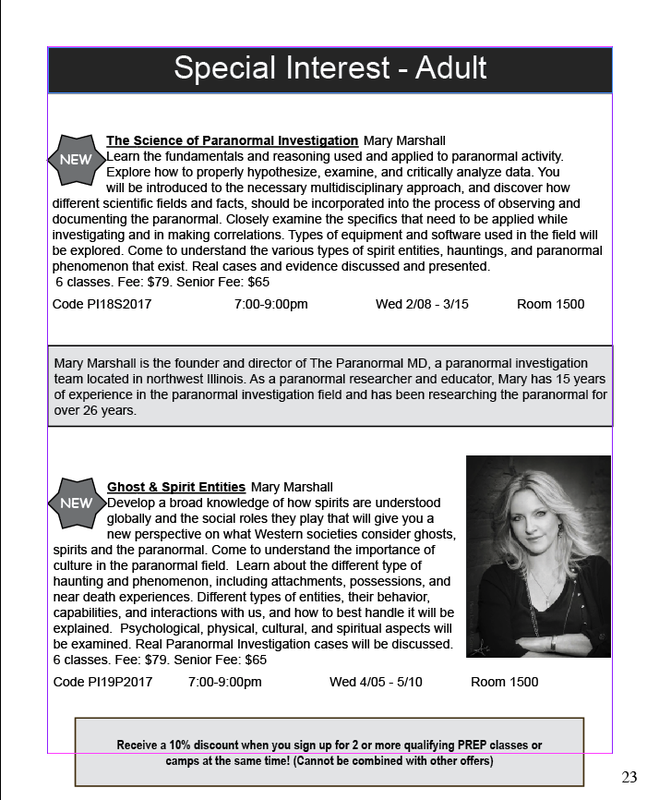 As an educator, Mary helped develop one of the first Paranormal Studies Program in the country that is taught at an institution for higher education. She personally teaches a few different courses of the many courses now available within the Harper College Paranormal Studies Program in Palatine, IL. Mary also teaches classes at College of Dupage, College of Lake County, and the Theosophical Society in America, and elsewhere.